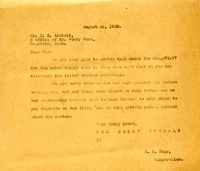 In this letter E. H. Hoge thanks Henry Ford for his check towards the girls recitation hall. The Henry Ford Motor Company sends $103,515.02 to The Berry Schools to be used for the Girls' Recitations Hall. In response to an inquiry about an incoming check, L. J. Thompson informs E. H. Hoge that the check was sent on August 28th and explains that this delay was caused by Mr Liebold's absence from the city. 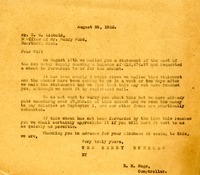 A letter from E. H. Hoge acknowledges a previous letter from the office of Henry Ford regarding an error of $1 in the statement from Brooks-Callaway company on a statement for payment of work on Berry's new water supply system. The $1 understatement would be added to the next statement for payment on the development of the water supply system. Mr. Hoge writes to Mr. Liebold that the check for the water supply came and apologizes for not waiting another day, but funds were almost at rock bottom. 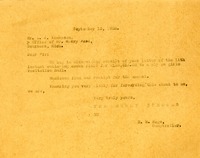 In this letter E.H Hoge tells Mr. LIebold that the check has not come for the last receipt that Berry sent. He asks if they could send it if it has not already been sent. 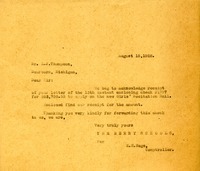 L. J. Thompson writes to E. H. Hoge answering his letter to Mr. Liebold sending a check as he requested. He also notes that there was an error of $1.00 and asks that the office check that and send him a corrected copy of the statement. 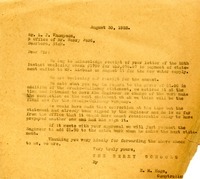 In these letters E.H. Hoge representing the Berry Schools, is asking L.J. Thompson for a check for the new Girls' Recitation Halland E.G. Liebold a check for the cost of water supply. 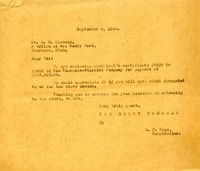 The office of Henry Ford encloses a check on the account of the Girls' Recitation Hall. Mr. Liebold signed a check for $25,000 which is enclosed. 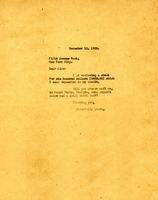 Liebold left the city and any correspondence will be brought to his attention when he returns. The secretary for Mr. Frothingham sends a check of $1000 to the Berry Schools. Miss Berry sends in a check for $600 to be deposited to her credit and asks to be sent back some deposit slips and a small check book. 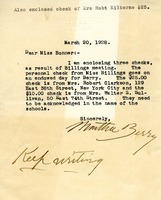 Martha writes to Miss Bonner with three checks that need to be acknowledged.